Kinesiology researchers at UNB believe there could be health benefits of standing more often for seniors in nursing homes who normally spend most of their time sitting. 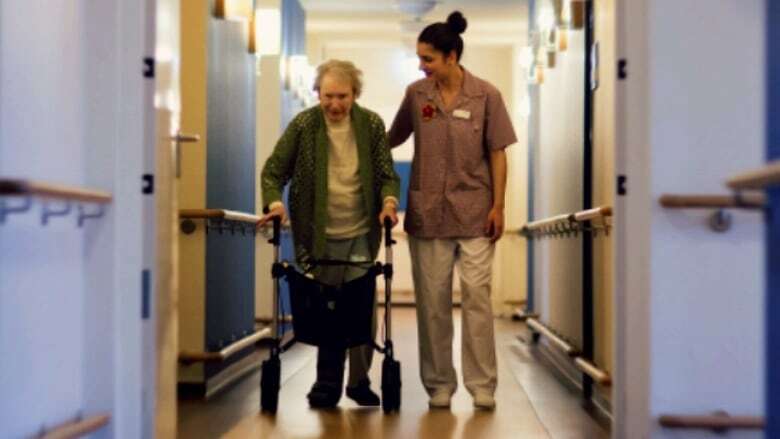 Some researchers from the University of New Brunswick and the University of Moncton are heading into four nursing homes in January on a mission to get seniors on their feet. "If there's one segment of the population that would benefit more from standing, they're probably the seniors," said associate UNB kinesiology professor Danielle Bouchard. Bouchard is leading an effort to evaluate the health benefits of standing, especially for people who can't get up on their own. It's a question of special relevance to New Brunswick, with its aging population, as the standing-for-health trend continues. You may have heard someone say "sitting is the new smoking," or seen standing desks introduced in many workplaces. Even Health Canada launched a program called "Sit Kicker," saying people can reduce their risk of developing chronic illnesses, such as obesity, cardiovascular disease, Type 2 diabetes and respiratory diseases by "spending less time sitting and more time standing, walking, and engaging in light movement throughout the day." "If you're still able to go for a run or go for a walk, there's probably more benefits of moving at that intensity than just standing," said Bouchard, "but for those people that can't do more intensity, standing might be an option to have some benefits." Those benefits could include improved circulation, mobility, functionality and strength, she said. Bouchard oversaw a 10-week project last summer, in which eight to 10 student volunteers went to the York Care Centre in Fredericton four times a week, three times a day. They helped people get to their feet and then monitored them as they stood on their own. "We were always within an arm's reach of them," said kinesiology graduate student Amanda Lee. "They stood together in a group and we just kind of chatted." "It became more social than I thought it would be." "A few people did significantly improve," said Lee. "There was one guy who couldn't stand for 10 minutes at first and he ended up standing for an hour." Others increased the distance they were able to walk, she said. According to interview excerpts released by the researchers, there were other positive reviews. A family member of one participant was pleased to see a new exercise program of any kind and noticed their loved one regained confidence to stand and care for themself. A patient who participated said the program left them a little sore, but they were sorry to see it end and eager to sign up if it's ever offered again. The program isn't returning to the York Care Centre at the moment, but two hired researchers are heading to the Pine Grove and Shannex nursing homes in Fredericton for a six-month project. The University of Moncton will send another two researchers to locations that have not yet been confirmed, said UNB student and research staffer Molly Gallibois. The outcomes will be compared between the group that receives intervention and a control group of nursing homes, Gallibois said. Bouchard said more data is needed to convince nursing homes this is the way to go. One of the biggest things holding them back, she said, is the fear that having residents on their feet more will increase their risk of falling. Bouchard called that notion a vicious cycle. Many people are put in wheelchairs for safety reasons, she said, and spend as much as 90 per cent of their time sitting. "When they actually have to stand … for brushing their teeth or going to the bath or any other activities of daily living … they're actually more at risk of falling because they're so weak," she said. Bouchard said that risk needs to be managed, preferably without requiring any additional staff resources at nursing homes. She suggested perhaps standing could be incorporated into more of the existing organized activities. "For example, you play bingo and every time you have a 'B' every one stands up." There are also technical aids, such as mechanical lifts, she said, and a largely untapped student resource. "They really want to have some experience with seniors and seniors love to see them."